Please join us for the next reading on Tuesday, November 3rd. 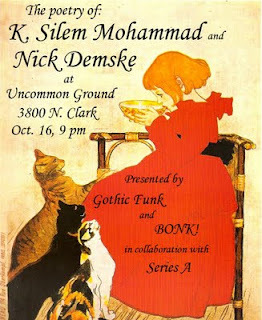 The reading will take place at Hopleaf, 5148 N. Clark St., Andersonville, Chicago. ROBERT DUFFER has written for WBEZ's 848, TimeOut Chicago, Chicago Tribune, Chicago Parent, New City, Chicago Artists Resource, Chicago Scene and others. Stories, essays and novel excerpts have appeared in journals like MAKE Magazine, Annalemma (3 & 4), Flashquake (Winter '05, Spring '09), Word Riot, Pindledyboz, The 2nd Hand. He teaches at Columbia College Chicago, where he earned his MFA, and is the Chicago literary correspondent for The Examiner. WILLIAM SHUNN returns to Tuesday Funk with another installment of his memoir The Accidental Terrorist. LYNN SUH was born in Cambridge (MA), and moved around quite a bit as a child and teenager, living in Paris, Chicago, Seoul (Korea), and Berkeley (CA) before finally managing to settle down in Chicago once again. His poetry is informed by diverse influences, including Rilke, Tolstoy, and Mozart. He presently freelances as a violinist. CHRIS SWEET lives in Chicago and sometimes teaches composition and rhetoric at Harper College in Palatine. He is the author of a poem, "The Burden," published in Men of Our Time, an Anthology of Male Poetry in Contemporary America, where it is comfortably sandwiched between Kenneth Gangemi's "First Marriage" and James Dickey's "Adultery." He has also written "The Book of Matches" which appears in The Best of Hair Trigger and "Mason The Dean" in Hair Trigger 20. Hair Trigger is the annual produced by Columbia College's Fiction Writing program. If you're into arcane professional journals and have money to burn or you have access to a university library, check out his "The Brightening Glance" in The Journal of The Assembly for Expanded Perspectives on Learning, "Volume 10, At Risk: Teaching and Writing outside the Safety Zone." Due to gnostic turpitude and other atmospheric fluctuations, the details of our Special Event this Friday have changed. Unfortunately, K. Silem Mohammad will not be reading at this event. However, we are happy to welcome several talented poets including Nick Demske. Apologies for the shortness of notice for this change. 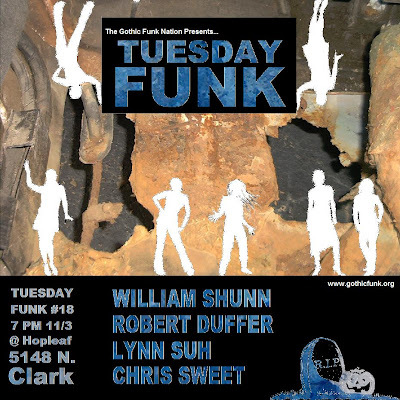 Presented by the Gothic Funk Nation and BONK! in collaboration with Series A.
Friday, October 16th at 9 PM. K. SILEM MOHAMMAD is the author of Deer Head Nation (Tougher Disguises, 2003), A Thousand Devils (Combo Books, 2004), Breathalyzer (Edge Books, 2008), and The Front (Roof Books, 2009). He edits the poetry magazine Abraham Lincoln with Anne Boyer, and is a co-editor of the forthcoming Flarf: An Anthology of Flarf (Edge Books, 2010). He teaches literature and creative writing at Southern Oregon University.